So your regular Salsa Verde usually has tomatillos in them, which gives it the “verde” along with the jalapeños. But it also cools down the heat. So I decided to leave the tomatillos out of the equation and just make it all about the jalapeños. This recipe is ideal on any mexican dish, especially tacos 🙂 The smokey taste from the charred jalapeños and onions enhance the flavor of the salsa and give it a nice kick! 1. Preheat your broiler on high. 2. Coat the jalapeños and cut up onion with olive oil. Place on a foil covered sheet pan, then under the broiler for 8-10 minutes until charred and cooked through, making sure to turn the ingredients half way through cooking so each side is charred. 3. Remove the charred ingredients from the broiler and allow to cool. 4. 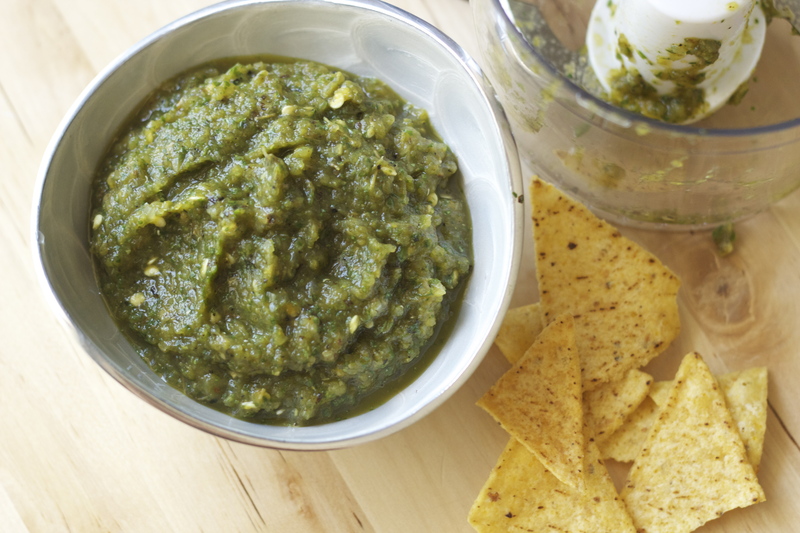 Once cooled, place the jalapeños, onions, and the remaining ingredients into your food processor and puree.